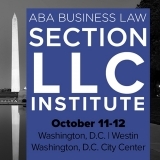 Corporate Partner, Tammy L. Mercer, will be a panelist at the upcoming 2018 ABA Business Law Section LLC Institute being held in Washington, D.C. on October 11th and 12th, 2018. The panel discussion, entitled "Delaware and Bankruptcy Case Law Update," will cover recent LLC and partnership cases, including those dealing with fiduciary duties, implied covenants and dissolution. There will also be an update on recent bankruptcy decisions of interest. Ms. Mercer will be joined on the panel by Lou Hering (Morris, Nichols, Arsht & Tunnell LLP, Wilmington, Delaware) and James J. Wheaton (Boston University School of Law, Boston, Massachusetts).